From Jupiter, Florida, David Sprague celebrates every Christmas season with lights and music. For the past 2 years, Pixel Pro Displays had worked with the Sprague's to help spread the holiday cheer to their friends and neighbors. In 2016, David duplicated his entire light display and installed it at the Christ Fellowship Church. As per his specifications, we built the layout with 2 mega trees and 3 matrix panels. 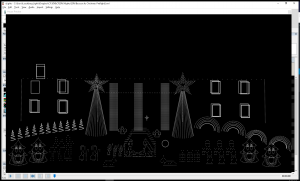 Also the display included 4 nested pixel arches, a pixel tree line, 4 singing trees, and the entire nativity scene. This project included over 200 sequencing & layout hours with more than 40 minutes of music. The work continued through December as the family sets up another light display for their home. Then, on December 26, the nativity scene is switched out for a grand New Years scene. The work continues! Most of the song are switched out to celebrate the new year with wonderful party songs. For 2017, David has a project, building a new home! This year we had to redesign his display to fit his new home. The display consists of 5 e682 pixel controllers and 2 e6804 pixel controllers. He also run 5 Light-O-Rama controllers, all driven by the xLights 2017 sequencing program. David is one of Pixel Pro Displays very first clients. Thank you David Sprague and Family!